Being a small employer may shield you from complying with some hefty laws, but it will not shield you from the Fair Labor Standards Act of 1938 (FLSA). The FLSA applies to all employers, regardless of size, but it does have a few exceptions. The focal point of the law is wage and hour standards that affect minimum wage and overtime, employment of minors, and recordkeeping requirements. The first step to compliance of the law is accurately classifying your workforce as “employees” or “independent contractors”. You will then further classify your employees as either “exempt” or “non-exempt”. These two categories (exempt and non-exempt) are for FLSA purposes. Non-exempt employees are entitled to overtime compensation for hours worked after 40 hours in a workweek. Exempt employees are not entitled to overtime. HRinMotion, LLC can assist you in appropriately classifying your workforce. The federal minimum wage is $7.25 (since 2009). Most states have their own minimum wage. Employers are to pay covered non-exempt employees the higher of the two. For example, federal minimum wage is $7.25 per hour while the District of Columbia’s minimum wage is $12.50 per hour (increasing July 2018). The District of Columbia employer must pay the non-exempt employee at least $12.50 per hour. Covered non-exempt employees are also entitled to overtime pay for any work performed after 40 hours in a workweek. The overtime pay rate is one and one-half the employees regular rate of pay. 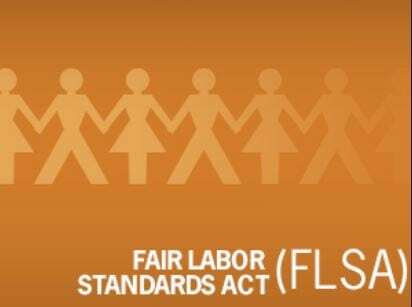 The FLSA enacted child labor provisions which established the requirements employers must follow when employing minors (those under the age of 18). For example, a 16-year-old may work unlimited hours, but may not be a coal miner. Employers are required to display and maintain an official FLSA poster. The poster is to be displayed in an area where employees frequent (e.g., a break room). Employers can obtain an FLSA poster from the Wage and Hour Division. In addition to the poster, employers must maintain employee records regarding their hours and compensation (e.g., payroll records, time cards, etc.). Record retention rates vary. An employer may be subject to civil or criminal actions. Per the Wage and Hour Division, willful violators may be prosecuted criminally and fined up to $10,000 with a second conviction (possibly) resulting in imprisonment. Per the Wage and Hour Division, civil penalties adjust annually for inflation with the current maximum penalty for each repeated or willful violation of minimum wage and/or overtime at $1,925. Employees can also file suit for damages and attorney fees. Wage and hour enforcement is not only at the federal level, but most states have enacted their own legislation to impose further regulation. For example, Maryland enacted the Maryland Lien for Unpaid Wages law which allows employees to file a lien against their employer for unpaid wages. The Secretary of Labor may also sue employers with the winnings going to the employees who were owed. An individual’s immigration/citizenship status does not exclude them from the protections of the law. Undocumented workers have been awarded settlements under the FLSA and related legislations. As always, HRinMotion, LLC is here to assist you with your compliance needs. Give us a call at 240-838-7142 or email us at info@hrinmotionllc.com to schedule your consultation. Boomerang Employees: Should You Rehire a Former Employee? Personnel Files: What’s in Your File?